Much as I couldn't believe President Barack Obama won the Noble Peace Prize so too today I'm equally befuddled at the news from the Associated Press via Huffington Post that alleged traitor Bradley Manning has been nominated for the Noble Peace Prize for his possible act of treason with leaking classified material to WikiLeaks. Manning who has become the love child of LGBT bloggers and activists who in my opinion put the Rainbow over the United States and their loyalty to the aforementioned first, are just as screwed up as Manning who suffers from "identity crisis". Last week at a hearing Manning declined to enter a plea. 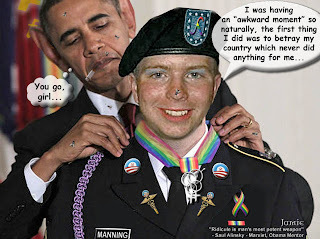 I suppose when Manning ends up in prison they'll be sending him gift baskets of cookies and writing him letters and those of the T will be complaining the military prison system isn't meeting Manning's identity needs. Another thing which is beginning to annoy me to no end is the fawning of bloggers and websites over photos of lesbian and gay service members lip locking their beloveds. Yes boys and girls this is why so many fought so hard to end Don't Ask Don't Tell, so many can say "look de gay can kiss in uniform".